DVARCA – A unique masterpiece, one of its kind. I was very young when I read a classic tale of 1984 by George Orwell. It gave me all sorts of instruments to look into the future with my dark glasses on. I kept digging around since then to look for similar kind of imagination and vision. My decade long search ended today while reading the last pages of DVARCA. 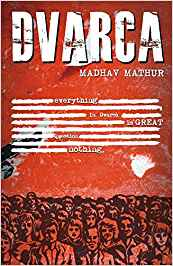 First of its kind by an Indian author, this book will take you through a scary journey of a dystopian future where Indian sub-continent is renamed as DVARCA. Anarchic state religion Navmarg controlling all possible aspects of its inhabitants. You should work according to them, eat according to them, and even think according to them. Every possible definition of freedom is crushed under the strict anarchic rule based on an orthodox system. The totalitarian government uses cutting edge technologies like genetic mutations and futuristic controlling devices to give pseudo belief of freedom. Your Karma and Dharma will earn you Punya based on the calculation of a mathematical formula. You will work your life out to earn punya with the sense of false Moksha. Vivid descriptions and lucid writing style give you goose bumps at more than one occasion. It helps you to create the imagined stage for the story as thought by the writer. However, I felt that some key characters were not described in detail (May be left out for the sequels). Some sub-plots too were left on a cliff hanger, definitely pointing to an upcoming sequel. One special mention to the effort put in naming each chapters. Interesting titles of chapters actually gave flare to the book. Author used some of the very ancient rituals and regulatory rules like Maika system, gender biasing, curse words giving it a totally different dark perspective. This all seemed to be possible in distant future to me when I initially started reading book. But as I made progress, it instilled primal fear in my heart and gave chills to my spine. I started questioning myself at the turn of every other page – ‘can it be even possible?’ And when I started getting ‘Yes’ frequently is when I really understood the real horror that might really occur in our life. This book shook my belief and raised question on the fundamental understanding of my religion. By the end of the book, I found myself wiser in my understanding of the complex concept of Religion. ‘He who fights with monsters might take care lest he thereby become a monster.